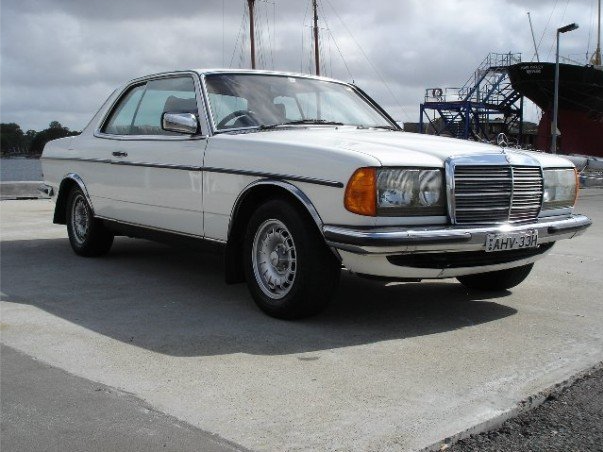 Mercedes Benz have always provided a range of handsome coupes in their range, which are still even years later a practical classic car, and can easily be used a daily drivers. This article is going to focus on the Coupe models from the 60s, 70s and 80s, which are the most available for the collector and most practical. The Mercedes range normally contained both a mid-size and full-size coupe, offering a lot of options for todays buyers. I am not including the range from the 50s which are rare and now very expensive, or the 90s that are more modern used cars. 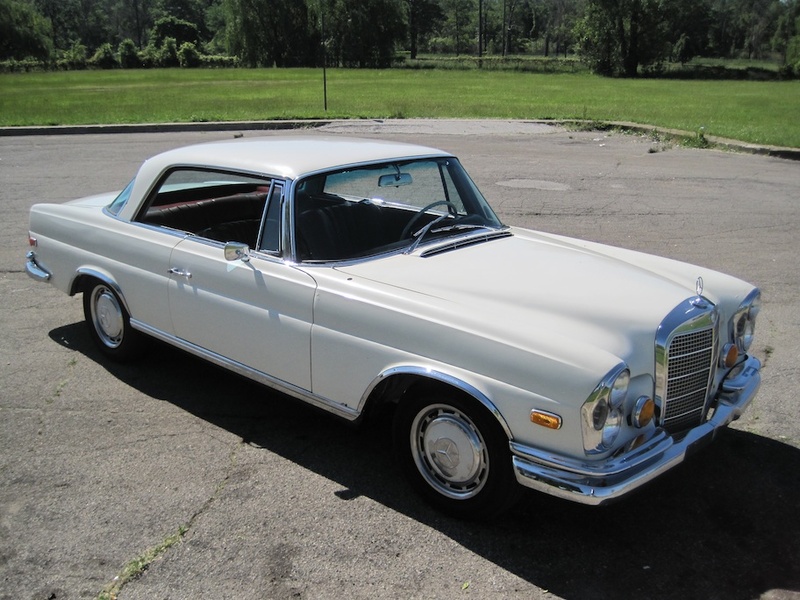 The cheapest way of getting the classic Mercedes look with the upright headlights and large radiator grille. Some find the styling around the C pillar and large boot a bit ungainly. Can be hard to find in good, rust-free condition. A nice example can be purchased from between $5,000 to $12,000 in Australia depending on model and condition. The pick of the bunch was the 280CE, the DOHC six. Some early cars may be manual, but most will be Automatic. Few have air conditioning. Arguably the most handsome of the mid size range. A practical everyday car, with good examples still available. A nice example can be purchased from between $5,000 and $10,000 in Australia depending on model and condition. The car above is a 280CE my brother used to own. These cars have air conditioning, many have sunroofs and some have power windows. Australian models have the ADR27A emissions controls, which makes them less powerful than the W114 even with the same engine. In Australia, they are nearly all automatic. Summary: The W111 provides everything you want in a classic Mercedes. Elegant good looks, exceptional build quality, great engineering and technology and that classic Mercedes feel. The W111 coupe was introduced in 1961 as the 220SE based on the successful ‘fintail’ sedan. The styling however, was more elegant with the prominent fins of the sedan scaled back and rounded off to fit in much better with the lines of the car, the unpopular thermometer instrument cluster replaced with a similar setup to the 300SL, but with the gauges enclosed in a suburb wooden binnacle, at least up to 1967. The W111 interior came fully equipped with leather and it was only available with fuel injected engines. The original model, many more found with manual transmissions as they can be a bit slow with the automatic. Most models will not have air conditioning, and some have rare options like manual sunroofs and sports seats. 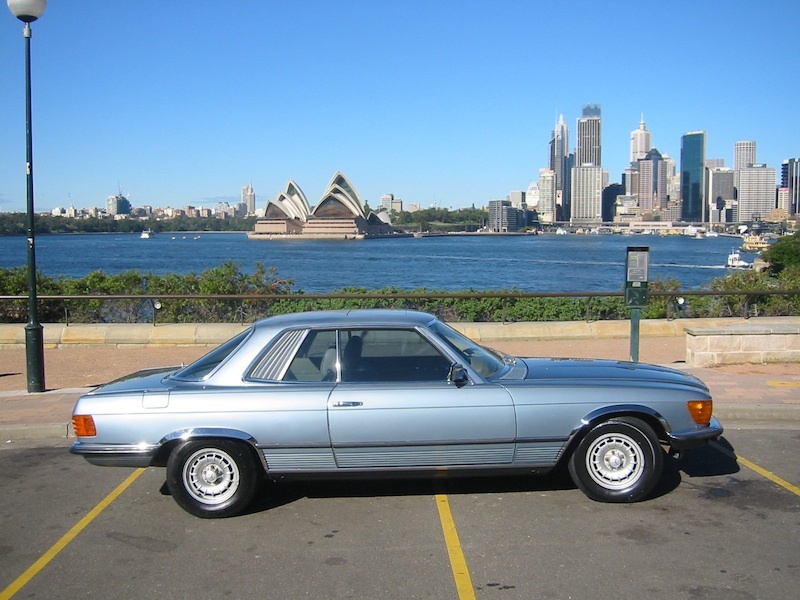 220SE’s start from around $10,000 and go up to around $35,000 for a excellent drivers car. Very similar to the 220, but with the more powerful 250 engine and other useful upgrades from the W108 such as a larger fuel tank, better brakes. More likely to have automatic transmissions and air conditioning, although power windows are still very rare, but available. Prices from $15,000-$40,000. The 2.8 liter M130 was the pick of the six cylinder engines, with more usable power, and a reputation for being more robust. Cars from late 1969 have the lower and wider grille from the v8 model, and some of the charm of the original interiors is missing (e.g. the wooden instrument binnacle). Prices from $20,000-$50,000. The all new 3.5 liter engine destined for the new SL and S class was tested in the older models for a couple of years. The 3.5 is regarded as the pick of the bunch, although the power of the engine can show up the suspension setup. Prices from $45,000-$75,000. On the introduction of the V8, the front grille was lowered and made wider. Personally I think it looks good in the Coupe, but not as much in the cabriolet. Most have air conditioning, and some have power sunroofs and windows. The 300SE is actually a W112, which means it has Air suspension and the all alloy M189 engine. This puts it at the top of the range, but also significantly increases running cost. The engine and suspension are trouble free if maintained properly, but many were not and it can be cripplingly expensive to sort out today. A well setup air suspended car provides an incredible ride. Prices from $20,000-$40,000. There are many cheap cars out there that have had their air suspension removed and engine replaced by a 250 or a 280. The 107 coupe, unlike the other two in the ‘large’ class was based on the SL, not the S class. This gives it a sportier look, but less interior room, and it is more of a 2+2 than a full four seater. Some people find the long wheelbase of this car ungainly and dislike the louvers, but I think it looks sleek and has an elegance that the SL does not. Handling is improved on the SL with the longer wheelbase and increased rigidity. The SLC could be purchased with a 2.8 Six, or 3.5, 3.8, 4.5 or 5.0 V8s. The 5.0 was a limited production car to allow Mercedes to quality for rallying, which was rather successful. Outside the LHD only 5.0, the SLC can be bought for between $10,000-$20,000. Condition is more important than engine. Only the 2.8 and 3.5 were available with manual, and few were sold. The biggest Achilles heel of this car is rust, with many rusty cars available cheaply. The engines are all reliable if looked after. I have owned a 450SLC for over 10 years and used it as my everyday car for about half of that time. The 107 responds well to a small increase in wheel size, to either 15″ or 16″. Many go bigger, but in my view this spoils the look and compromises the feel of the car. 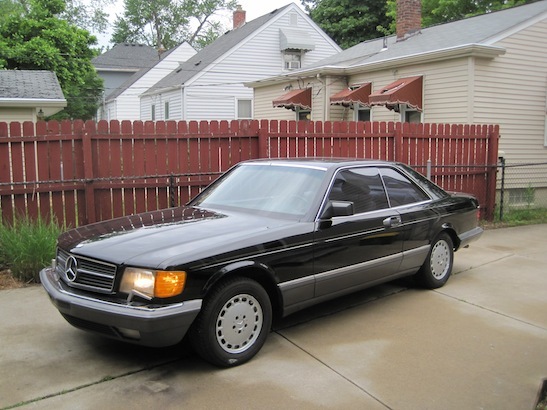 Many regard the W126 as either the first modern Mercedes, or the last classic Mercedes. Either way, it offers a nice blend of both, with the classic styling, but more modern features like ABS brakes, airbags, power etc. I have owned two 560SEC‘s and they make great daily drivers. The 560 gives great power even in the emissions compliant version made available to Australia and the USA. (the picture above is the USA model with its large bumpers). The Gen 1 cars were available until 1985. In Australia at least, only the 380 was sold officially, so an 500 is an import. These cars are generally cheaper than the updated gen 2 cars with prices from $10,000-$15,000. In Australia, 1986 was the first year for unleaded petrol, so Australian delivered cars have catalytic converters (560 was the only model officially imported). These cars have some useful upgrades including styling improvements to the lower door panels, upgraded interior after 1988, standard airbags and ABS and the 560 engine was a very good improvement over the 380. Many people covet the unofficial cars without a catalyst as they have significantly more power (e.g. 300hp vs 240 in the 560). Prices from $15,000-$25,000.